Border Esk Fencing Ltd will always handle your information in a responsible way according to and in line with the GDPR. GDPR stands for General Data Protection Regulation, replacing the Data Protection Act 1998 and will come into effect on 25th May 2018. If at any time you wish us to cease processing your personal data or contacting you for marketing purposes, please contact Border Esk Fencing Ltd on 01228 791 423 or in writing to Border Esk Fencing Ltd, Unit 9, Whitesyke Business Park, Brampton Road, Longtown, Carlisle, CA6 5TR. 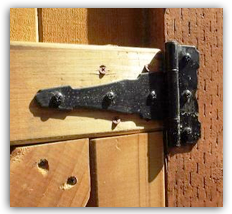 Selection of hinges generally for exterior use on outbuildings, stables, sheds, gates and garages, including T hinges in various gauges, heavy reversible hinges with secure cup fittings to prevent the door being lifted off and hook and band hinges. Straight and necked tower bolts, spring loaded bolts, pad bolts, garage door bolts and holders, bow handle bolts, monkey tail bolts, foot bolts and chain bolts. 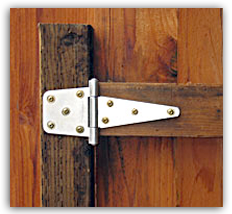 Our ornamental ironmongery range is designed to complement our range of oak doors. 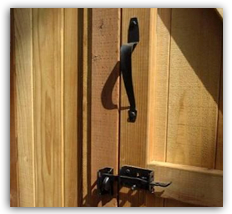 Door fittings are available in heavy duty epoxy coated black. Proficient installation of these products presents rather more of a challenge to the DIY enthusiast, which is why our staff are always on hand to provide advice on the best way to tackle any project. 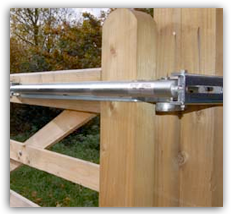 Naturally we offer a range of installation solutions with a reputable, well known contractor for any style of Fencing, Trellis, Gates, Decking or Pergola, complemented by our unrivaled, free site inspection and design service.